The Presidio’s chapel is one of the oldest operating churches in America. The Presidio Nuestra Señora de Loreto de la Bahía (Presidio de la Bahía) served the people of four independent nations: Spain, Mexico, the Republic of Texas, and the United States, and is recognized for its cross-cultural, religious, and military significance. Constructed in 1749 to protect the Spanish missions in South Texas, including the nearby Franciscan Mission Nuestra Señora del Espíritu Santo de Zuñiga, the Presidio de la Bahía is an outstanding example of a Spanish military compound. The presidio played a critical role in the development of Spanish and Mexican culture in the region and was important in conflicts that took place through the years of the Mexican Revolution (1821) and the later Texan Rebellion(1836). Today, the entire military compound, including the chapel (the “Lady of Loreto”) has been carefully documented and returned to its 1836 appearance. 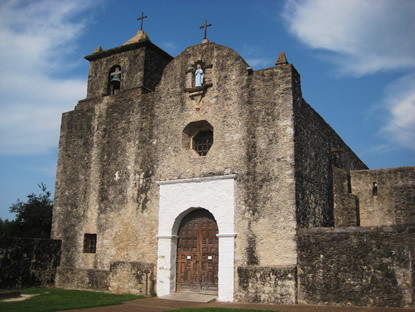 The National Historic Landmark now stands as an important religious and cultural center in the community of Goliad, serving as both a church and heritage site. Visitors to the Presidio Nuestra Señora de Loreto de la Bahía can explore the site to learn more about its history and stories that span over 250 years. During the early 18th century, the vicinity of Goliad was known as La Bahía del Espíritu Santo. The Spanish originally began populating “La Bahía” as early as the 1670s, in response to a sudden French interest in the area. Captain Domingo Ramon, of the Aguayo expedition, founded the first presidio in 1672 near the Matagorda Bay in order to prevent further colonization attempts by the French. By 1726, the Spanish moved the original fort inland first to a site along the Guadalupe River, and in 1749 a final time to Goliad across the San Antonio River from the newly established Franciscan Mission Nuestra Señora del Espíritu Santo de Zuñiga. The fertile land, nearby mission, and military presence attracted many Spanish ranchers and farmers to the area, and soon the presidio community grew into a sizable colony. In 1829, the town took the name Goliad, which it retains today. 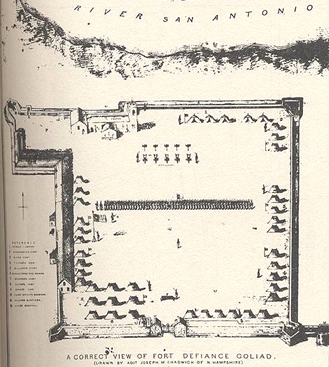 By the early 1800s the Presidio had grown into a large, walled and bastioned fort with permanent structures. Above a view c. 1836 with the chapel shown to the top left. The Presidio de la Bahía itself was a rudimentary construction at first. In 1749, the compound consisted of several small wooden buildings and approximately 40 simple grass huts. A rectangular palisade made of sharp, wooden poles enclosed the buildings. Several decades later, as the community grew, permanent stone structures gradually replaced the simple buildings and walls. By the 1790s, these would include a quadrangular, one-seventh mile in diameter defensive wall, rounded limestone bastions to mount cannon, officers’ quarters, storehouses, workshops, an arsenal, and the presidio chapel. Built at the northwest corner, the church had an impressive arched entrance, octagonal choir loft window, massive bell tower, and a small side chapel. The latter half of the 18th century brought great success to La Bahía and the colony flourished. Hundreds of local American Indians converted to Catholicism and worked hard to irrigate the surrounding fields and tend huge herds of cattle. By 1790, however, missionary activity ebbed, many of the ranchers left, and the era of prosperity drew to a close. This coincided with the beginnings of the Mexican Revolutionary period in which the Presidio de la Bahía switched military control from Spanish to Mexican hands several times before Mexico finally gained its independence from Spain in 1821. The Presidio was the site of several conflicts over the course of the War for Mexican Independence (1810-1821). In 1812, a Mexican force led by Bernardo Gutierrez and August Magee took the fort from the Spanish and held it during the resulting siege. In 1817, when the Presidio was once again under Spanish control, Lieutenant Henry Perry led 50 men against the fort, but failed to take the Presidio before Spanish reenforcements arrived. Finally, in 1821, James Long and his force of 54 civilians captured the fort, and held it for 24 hours before surrendering. The Presidio – known as Fort Goliad – also played a significant role during the ensuing Texas War for Independence. The Texan forces successfully took Fort Goliad from the Mexicans in 1835, but breakdowns in communication and command left them disjointed and weakened throughout the region. During the winter of 1835-36, one of the most horrific episodes of the war took place at the old presidio. Colonel James W. Fannin was in control of Fort Goliad at the time and, fearing approaching Mexican forces, decided to retreat with his supplies and men. Just two weeks after the famous Texan defeat at the Alamo, Fannin’s troops encountered the Mexican army. The Mexicans captured the Texans after a brief battle and took back the Fort Goliad chapel. After the Mexicans held the Texans prisoners for a week, word came from Mexican General Santa Anna to execute all of them. Between three and four hundred Texans lost their lives on March 27, 1836. Soon after, the former Presidio de la Bahía was abandoned. U.S. 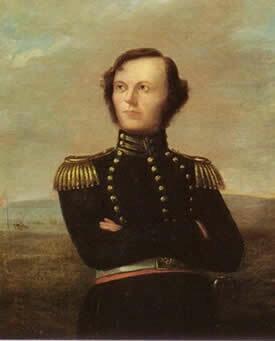 Colonel James W. Fannin, who, in 1836 was executed at La Bahía along with between 300 and 400 of his men. For a brief period in the 1850s, Judge Pryor Lea owned the presidio and used the chapel as a residence. The chapel returned to the Catholic Diocese in 1853, but the remainder of the presidio buildings and wall fell into terrible disrepair. A massive restoration effort began in 1963 to repair the failing church, document the site’s remains, and reconstruct many of the presidio’s former buildings. By 1967, the compound walls, commanding officers’ quarters, arsenal, guard house, workshops, and bastions, had been returned to their 1836 appearance. As both a State and national landmark, Presidio Nuestra Señora de Loreto de la Bahía and its chapel are now a popular attraction. The Chapel of Our Lady of Loreto is one of the oldest extant churches in the United States and has been continually operated by the Catholic Diocese of Victoria, Texas since 1853. The interior is noteworthy for its original “groin vaulted” ceiling (the oldest in North America) and for a beautiful fresco done in 1946 by renowned Corpus Christi artist, Antonio Garcia. The Presidio de la Bahía also houses a history museum within the old officers’ quarters. The museum offers exhibits, artifacts, and an award-winning documentary movie. Another favorite is the annual living history program, a series of reenactments that takes place each March to mark the tragic events of 1836. Year-round, visitors are welcome to explore the presidio’s grounds, the Quadrangle, which includes various original rock buildings as well as recent reconstructions based on archeological evidence (such as the complex’s eight-foot high exterior wall.) Overall, experiencing the Presidio Nuestra Señora de Loreto de la Bahía is stepping back in time to be surrounded by the history of Texas, and realizing the important influence of Spanish and Mexican culture on the story of the United States. The Presidio Nuestra Señora de Loreto de la Bahía is a National Historic Landmark located one mile south of Goliad State Historical Park on U.S. 183 one mile south of Goliad, Texas on U.S. Highway 183 (77A). Click here for the site’s National Historic Landmark file: text and photos. The fort is open 9:00am to 4:45pm daily, but closed Thanksgiving, Christmas, New Year's Day and Easter. For more information, visit La Bahía’s website or call 361-645-3752. The Presidio Nuestra Señora de Loreto de la Bahía Chapel has been documented by the Historic American Buildings Survey and is also featured in the National Park Service’s South and West Texas Travel Itinerary.